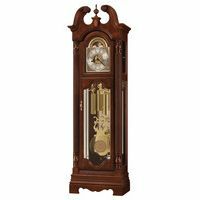 Meticulously crafted, elegant grandfather clock in dark walnut with fine stainless steel accents in pediment and base. All beveled crystal glass. 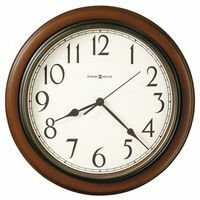 Silver plated multifunctional dial with etched rhombic decorations, applied diamond turned chapter rings, second indication, day of the month, day of the week, month calendar, moon phase feature, blued steel hands and easy adjustment of all functions. Chrome plated compensation grid pendulum with precision adjustment. 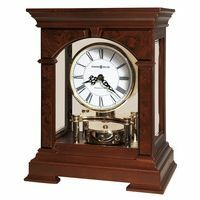 Polished 4/4 cable movement with Westminster chime on 8-rod gong, automatic beat adjustment, maintaining power, true second & automatic night time shut-off between 10.00 PM and 7.15 AM, multi function dial.